I suspect what is meant is being able to set the displays per channel LUTs rather than the video card, and/or uploading matrix & tables or cLUT to make it emulate a particular colorspace. Tweaking knobs on your CRT screen. Tweaking digital parameters via an OSD on your modern screen. Loading the things @gwgill mentioned above into the monitor. Loading calibration curves into the GPU (VCGT). It seems by “hardware calibration” you’re referring to points 2 and 3.
to change the video card LUT or whatever it is called, i.e. do actual (software) calibration. A LUT is a LUT, whether in the GPU or monitor (with the caveat as explained by @gwgill). Both are software, you’re not tweaking any analog knobs. does anybody happen to know if it is possible to use a spyder on a virtual pc? I mean this: Virtualbox is installed on Linux. Windows is installed on Virtualbox. 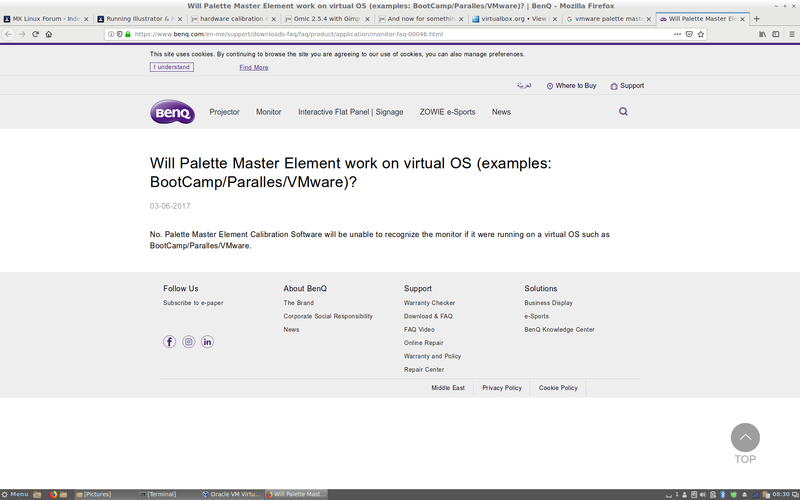 a calibration software such as Palette Master Element is installed on the virtual Windows. I am thinking of buying a license key for Windows in order to install it was a virtual system and then use it for the Palette Master Element software and the Olympus Viewer in order to update the firmware of my camera and lenses. but the license would be more or less useless if it would not work. Virtualbox offers usb passthrought so why not? You need to pass spider to Guest os (Windows) and that’s it. What you need to know whether your calibration software also uses usb to control monitor. And download Virtualbox extension pack and in windows install guest additions. Sorry, to be precise: my guest os was Centos6 32bit on Ubuntu 16.04 64 bits. But it should work for Windows anyway. That’s the idea of virtualization. I did it and it worked perfectly. Was the VCGT set correctly? Oh, the process is 2 step really. Now I understand your reservations. Calibration in guest os. Set desired hw profile in cal. sw. Grab icc profiles. Import generated icc into host os. Set the proper one. Guest is only for hw profile change or recalibration/verification. No need to use it otherwise. Vitrualbox is free only for non comertial use. Check the license. I think the same will work for livirt/quemu. plus, I am now on Mint Debian which has an old kernel. maybe check out the 4.19 kernel? You need passthrough the USB to the guest. So that for your host linux the USB device becomes invisible. It should not matter if linux is able to detect the hardware … so no kernel upgrade. The only solution I can image here is: If you have 2 graphics cards then pass the one which connects to the monitor to VM and use for system other one. That would require 2 monitors and I’m not quite sure if qemu/virtualbox supports that. Dual boot seems more reasonable. Cn 6 works. I’m using it like that. For calibration you need connect additional usb cable and passthru it to vm. Then copy icc to host machine. Cn7 - haven’t tried yet.